Northwest Christian Writers Association - James L. Rubart - "The Heart of Freedom"
James L. Rubart - "The Heart of Freedom"
James Rubart is the best selling and Award Winning author of the books Rooms, Book of Days, and The Chair. Known for his ability to inspire and encourage, James will kick off our September meeting with a bang. James' signature talk "The Heart of Freedom" explores the human longing for freedom, and the human frailties of fear. His talk is a catylist to help people throw off their chains and step into their destiny. You will be inspired by his journey in writing, faith and family. Please join us for a very special evening and welcome James Rubart! 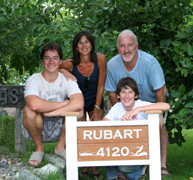 BIO: James Rubart says about himself, "I love God, my wife and my sons, writing, speaking, playing guitar, and golf, in that order. And I dabble in photography. I grew up in Seattle and Spokane and I went to University of Washington (Go Dawgs). Since 1994, I've been the owner of an ad agency/marketing firm." Devotional: Janie Downing - "Come Over"